BJP state leaders today said they were yet to decide whether the party would field candidates in the coming elections to four municipalities in the hills. The statement comes at a time Trinamul, Gorkha Janmukti Morcha, Jana Andolan Party and the CPM have started preparations in the hills for the polls which are likely to be held in May. 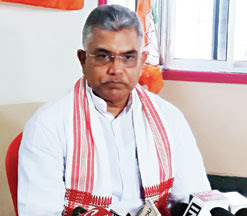 Dilip Ghosh, the state BJP president who attended a meeting of eight organisational districts of the party in north Bengal here this afternoon, said: "Our party has taken a clear decision that it will contest all elections in the state. However, we have alliances with the Morcha in the hills. Our Darjeeling MP S.S. Ahluwalia is holding talks with the Morcha. Once the civic poll dates are announced, we will take a final decision (as to whether to contest in the hills)." The remarks by the BJP state president, observers said, are indicative that the party might not contest the hill civic polls and let the Morcha - that is its sole ally in the state - to contest in all 84 seats spread across the four municipalities. "In many other parts of the state, the BJP is gradually gaining support. In the recent Parliament by-election in Cooch Behar, the BJP came second after Trinamul, and pushed the Left to third. Such improvements in the support base, particularly in the erstwhile Left bastions, have made the party decide to contest any poll," an observer said. In the hills, he pointed out, the situation is entirely different. "The Morcha is the only ally that the BJP has in the state now. The BJP leaders are also aware that the Morcha is the only party in the hills that can stop Trinamul from winning the municipalities. At this point, BJP leaders would focus on strategies to defeat Trinamul. Support to the Morcha will be part of such a strategy," he said. BJP insiders said the party also lacked necessary organisational base in the hills. "We don't believe there is much of a need to field candidates in the hills as it would mean adjustment of seats with the Morcha. Although we are allies, it can send a wrong message to the rank and file of the hill party and we are trying to get into the hills with their support," said a BJP leader. Further, sources in the BJP said there could be confusion among voters in case the BJP fielded candidates in some seats. The recent meeting between Prime Minister Narendra Modi and Morcha chief Bimal Gurung, after which the latter had claimed that he had got a "positive assurance" from Modi on Gorkhaland, is yet another indication that the BJP is not ready to lose the Morcha as its ally. "In such a situation, there is no point to jeopardise the relation between the parties by fielding candidates in the hills," a source said. BJP state leaders today said they were yet to decide whether the party would field candidates in the coming elections to four municipalities in the hills. The statement comes at a time Trinamul, Gorkha Janmukti Morcha, Jana Andolan Party and the CPM have started preparations in the hills for the polls which are likely to be held in May.